The rich and interesting culture of Mexico can be observed not just through their lifestyle but also through the food that they typically cook. Carne asada, chilaquiles, enchiladas, elote, chimichangas, guacamole, burritos, tacos, quesadillas, and nachos are just some of the many great and sumptuous Mexican food that one must try. Offering these delightful treats in your restaurant will surely make a great hit not only for those who are Mexican food enthusiasts but also for those individuals who want to try food from different races in different parts of the world. In order to make your offer more interesting and appealing and to provide a complete list of the food that you are offering, a menu that is well-crafted is needed. To help you get started, here are Mexican menu templates and examples that you can use or refer to. Looking for the best Mexican menu that contains not just great design but also the finest content? You have come to the right place. 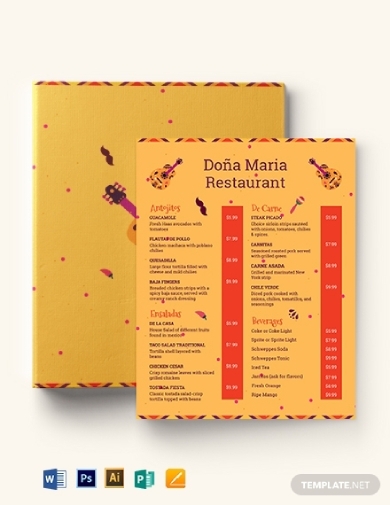 You can use this creative Mexican menu template to promote your good-looking and tasty Mexican dishes. This is creatively designed by professional graphic designers, and you are guaranteed with high-quality graphics and illustrations. This menu template is very versatile since you can customize the menu according to your current needs and preferences. It is also convenient for every user since it is available in many different file formats, namely Illustrator, Photoshop, MS Word, Publisher, and Apple Pages. With this, whether or not you are adept in using various tools and software applications, it is easy for you to personalize this template. Design a Mexican menu of your own preference in no time. With this chalkboard menu template, you will surely achieve the design that you have longed for. It is important to note that while aesthetics capture the interest of the audience, your content would make them read the entire menu. Hence, create an equally striking content with the use of this template. 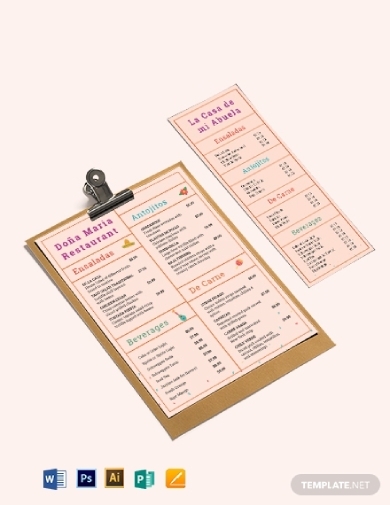 Moreover, you must not forget that menus are a way for restaurants, cafes, and alike to launch their branding. Hence, do not forget to incorporate your business name, tagline, contact details, company logo, and all other branding elements that are unique to your entity. This is helpful so that customers and prospects will have knowledge about your company and become familiar with your brand. Need to create a Mexican menu in an instant? This simple pastel Mexican menu can surely help you. Apart from your company details, provide the complete list of your dishes and categorize your food as follows: beverages, ensaladas (salads), antojitos (snacks), and de carne (meat dishes). 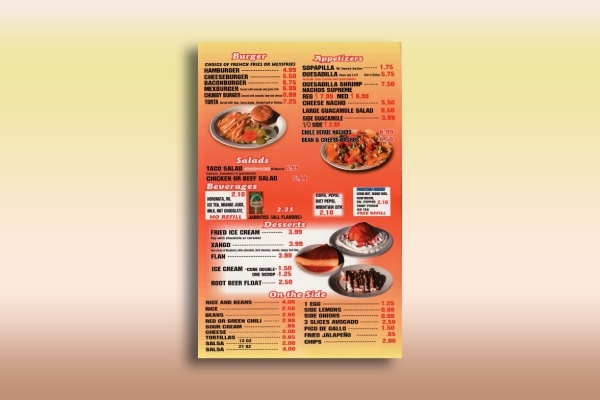 While a restaurant menu is important so that customers will get to choose what food they are going to order, you must also not forget to give them take-out menus so they can share their great experience with your food and service to their family and friends. In this way, you will gain more audience who are your potential customers in the future because of the word-of-mouth marketing from the people who have tried your great deals. A lot of people love taco because of its healthy ingredients that can provide you with a good balance of protein, fats, and carbohydrates. It has also a great amount of fiber, calcium, iron, and even vitamin C. Because of these, more and more restaurant, food stalls, diners, and specifically, taco shops have emerged. With the increasing number of business entities offering this healthy food, it is a must to have an edge over the competitors especially when it comes to marketing materials. 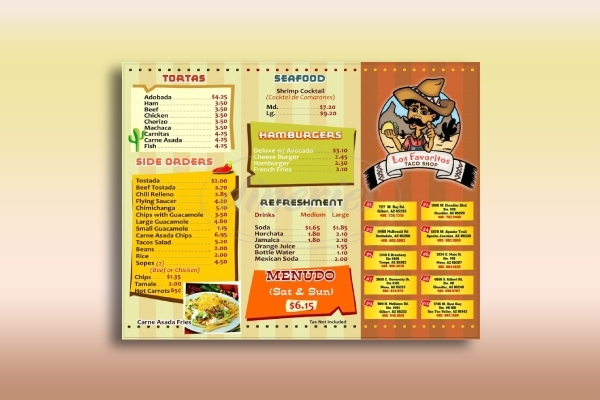 In order to do so, you can start with your menu and design it in a way that reflects your personality, such as this Mexican taco shop menu example. Note that your menu will define the culture of your company, so make sure that you are creating a professionally designed menu that best represents your entity. A meal should start with a luxurious appetizer such as spicy guacamole, fish taco nachos, jalapeño mango salsa, and chicken lautas with avocado cream. Offer these and all other appetizers you have to your customers through a well-designed Mexican appetizer menu, such as the one presented above. In this example, also presented are salads, which consists of tossed salad, guacamole salad, grilled chicken salad, grilled shrimp salad, and a lot more. Children’s plates are also offered, and the complete list of children’s food available is also itemized. When working on the design of your menu, you must make sure that it is appealing and appetizing enough so your customers will look forward to your great food. 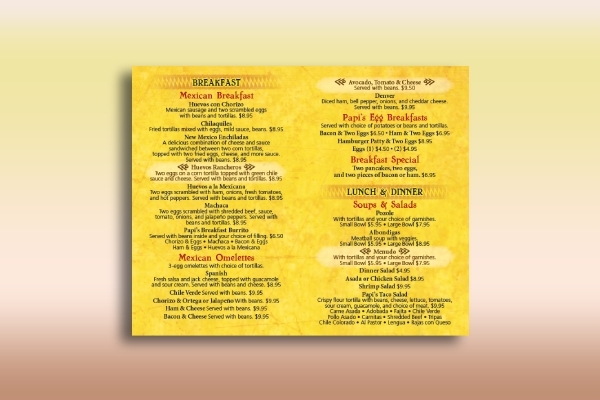 You can do this by using colors that are said to boost the appetite of the person, for example, red, orange, and yellow, similar to the colors used in this appetizing Mexican menu example. As you can observe from a lot of restaurants, they choose to paint their walls with these appetizing colors to evoke the taste buds and stimulate the appetite of their customers. You can also apply this concept to your menu, so that while they are still deciding on what food to order, their appetite is already being stimulated by your menu. It is stated above that red, orange, and yellow are the colors that will help stimulate and boost the appetite of an individual. 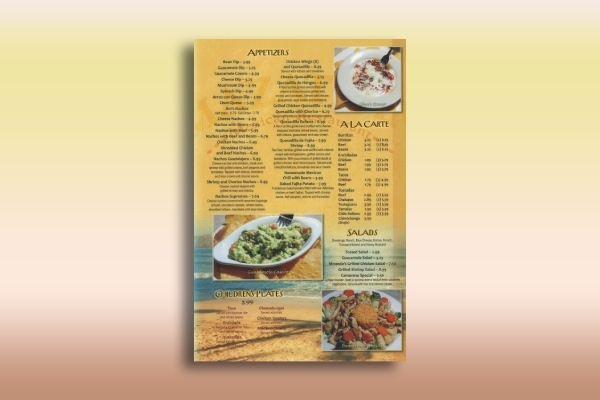 Hence, similar to the example above, this appealing Mexican menu uses colors that would make the customers hungry. 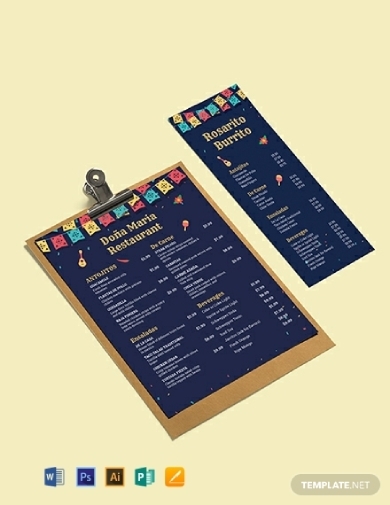 Moreover, it also contains high-quality graphics, so that people will have an idea on the presentation of the food that are stated in the menu. You do not need to have a photograph on all the dishes you are offering; instead, only feature the photos of your bestsellers or the food that is unique in your restaurant.